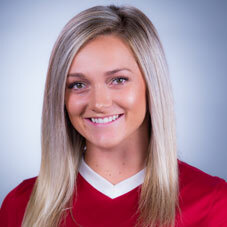 Played in 23 matches, starting 21, third-most among Razorback freshmen … Led the team with nine goals and seven assists for a team high 25 points … Also totaled 52 shots with 27 coming on goal (.519), leading all Arkansas players … Also led the team with four game-winning goals and took 37 corners, which were good for second … Her nine goals tied for the most by an Arkansas freshman in the last 17 years … Finished tied for fourth in the league in points, third among freshmen … Also tied for fifth in goals and tied for seventh in the SEC in assists … Scored her first collegiate goal in a 6-1 win over Abilene Christian (Aug. 27), part of a four-goal day … All four goals came in the first 60 minutes of play … She was the first Razorback with a hat trick and a four-goal game since 2001 … Is now one of 12 Razorbacks to score four times in the same match, which is also a program record for goals in a single match … Earned SEC Freshman of the Week honors on Sept. 18 after scoring game-winners against Mississippi State (Sept. 15) and Oral Roberts (Sept. 17), her sixth and seventh goals of the season … The score against Mississippi State, handed the Bulldogs their first loss of the year … Also turned in a game-winner against LSU (Oct. 12) … Picked up points in 10 matches overall, including five matches against conference opponents (MSU, LSU, Kentucky, Vanderbilt, Texas A&M) … Earned the assist on both goals in Arkansas’ 2-0 victory at Kentucky, both from corner kicks … Scored the equalizer in the 81st minute against Texas A&M in the SEC Tournament final, hitting a one-timer at the far post after a throw-in … Earned invitation during offseason to USWNT U-19 Training Camp in San Diego during the month of May. Led TSC Hurricane in scoring for three years … A two-time leading scorer in the Texas Conference … MVP of multiple ECNL matches. Four-star recruit according to TopDrawerSoccer.com … Ranked the No. 26 player in the nation according to IMG Academy, as well as the No. 2 South region player and the No. 12 forward … One of three high school athletes selected to participate in the U.S. team camp prior to the 2018 FIFA U-20 World Cup … Missed half of her junior season (2016) due to playing with the U.S. U-18 squad … Traveled to Spain with the U-18 team and delivered the assist on the game-winner against England … Two-time (2015 & 2016) NSCAA All-American and the only Oklahoman selected to the team her sophomore year (2015) … Named the Gatorade Oklahoma Girls Soccer Player of the Year and the Jim Thorpe Female Player of the Year following her junior season … Scored two goals and had one assist in a win over Owasso in the 2016 Oklahoma Class 6A state championship game … Helped lead Union HS to a 19-0 record in 2016, marking its second straight unbeaten season … Played with fellow signee Taylor Malham … Scored 10 goals and added eight assists in 2015 … Three-time Tulsa World All-Metro first team selection … Scored 17 goals a sophomore to lead Union HS to a 17-0 record, Class 6A championship and No. 1 spot in the TopDrawerSoccer.com rankings.